The Golden Rod was just beginning to bloom. This year has been a super year for Golden Rod in Central Eastern Indiana. The bloom began just prior to the beginning of September about the same time we began getting some much needed rains. I took pictures on 8/30 that show it beginning. I would estimate the bloom has reached its peak by now, but it will continue until there is a really good widespread frost. All of the hives have been working it. How do I know? because it smells like dirty socks around all of the hives. This was another “problem that wasn’t really a problem”, from my first year of beekeeping. That first fall I thought I had some type of Foul-brood disease, because the hives stunk so badly. I called a mentor who had a good laugh over it and said, “they are just working Golden Rod”. Bee working some Golden Rod at the home Apiary. Golden Rod is native to North America and isn’t actually any one particular plant. Golden Rod(s) refer a Genus of perennials, Solidago that contains about 100 species of flowering plants. Unfortunately it is seen as a weed here, because it isn’t corn or soy-beans. It’s what I consider the last shot at a nectar source in my area, and a GREAT WEED to have around. Parts of some goldenrods can be edible when cooked. Goldenrods can be used for decoration and making tea. Goldenrods are, in some places, held as a sign of good luck or good fortune. They are considered weeds by many in North America but they are prized as garden plants in Europe. Goldenrods are attractive sources of nectar for bees, flies, wasps, and butterflies. Honey from goldenrods often is dark and strong due to admixtures of other nectars. However when there is a strong honey flow, a light (often water white), spicy-tasting honey is produced. While the bees are ripening the honey produced from goldenrods it has a rank odor and taste, but finished honey is much milder. Inventor Thomas Edison experimented with goldenrod to produce rubber, which it contains naturally. His experiments produced a 12-foot-tall (3.7 m) plant that yielded as much as 12 percent rubber. The tires on the Model T given to Thomas Edison by his friend Henry Ford were made from goldenrod. The rubber is only contained in the leaves, not the stems or blooms. Typical rubber content of the leaves is 7 percent. Solidago virgaurea is used in a traditional kidney tonic by practitioners of herbal medicine to counter inflammation and irritation caused of bacterial infections or kidney stones. Goldenrod has also been used as part of a tincture to aid in cleansing of the kidney or bladder during a healing fast, in conjunction with potassium broth and specific juices. Native Americans chewed the leaves to relieve sore throats and chewed the roots to relieve toothaches. The goldenrod is the state flower of of Kentucky and Nebraska. It used to be the state flower of Alabama, but was later rejected in favour of another flower. 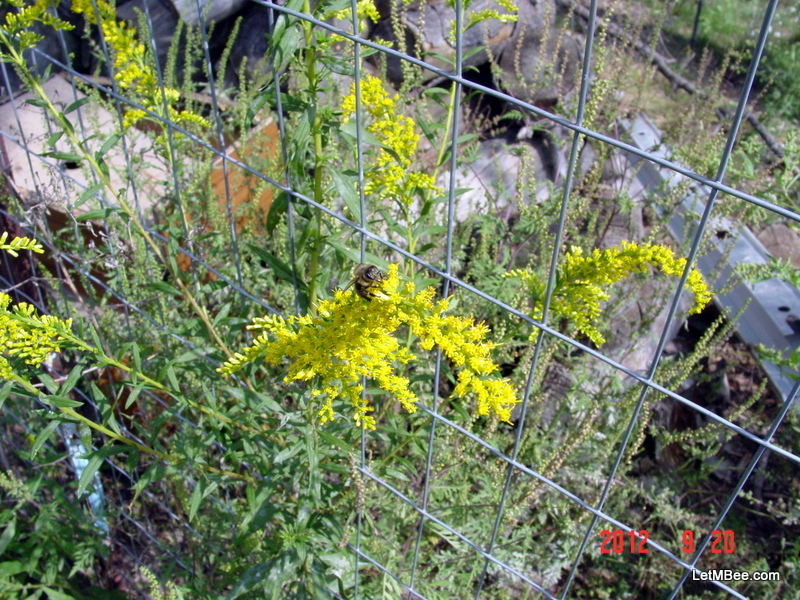 Goldenrod was recently named the state wildflower for South Carolina. The Sweet Goldenrod (Solidago odora) is the state herb of Delaware. In Midwestern states in the mid-twentieth century it was said that when the goldenrod bloomed, it would soon be time to go back to school—the blossoms appeared in mid- to late August, shortly before the traditional start of school on the day after Labor Day. All of the bullet points came from wikipedia. There is some more information there about Golden Rods if you are interested. This entry was posted in Great Weeds, Posts and tagged bee, beekeeping, Golden Rod, Indiana Beekeeping, Jason Bruns. Bookmark the permalink. Love Goldenrod! I put a bouquet of Goldenrod inside my bee friendly flowers educational exhibit at the Topsfield Fair. I hope it helps a few other people realize how important a flower it is to honeybees and other pollinators. I have also heard that the honey the bees make with it is one of the most nutritious for them to overwinter with too. I had not heard that, but wouldn’t doubt it one bit. The more I study nature the more I come to understand that all of the cycles appear to occur “just when they are supposed to”. When the bear is needing to pack on the pounds for hibernation in the Pacific Northwest the salmon are running. Deer breed in the fall and drop the fawns in the spring after all of the bad weather is over and food is easier to come by. We can ask ourselvs why, or the old chicken or the egg question all day long, but it doesn’t matter it just IS. We need to learn it and use it to our advantage like the bear, instead of fighting against it all the time. I am going to look into that. 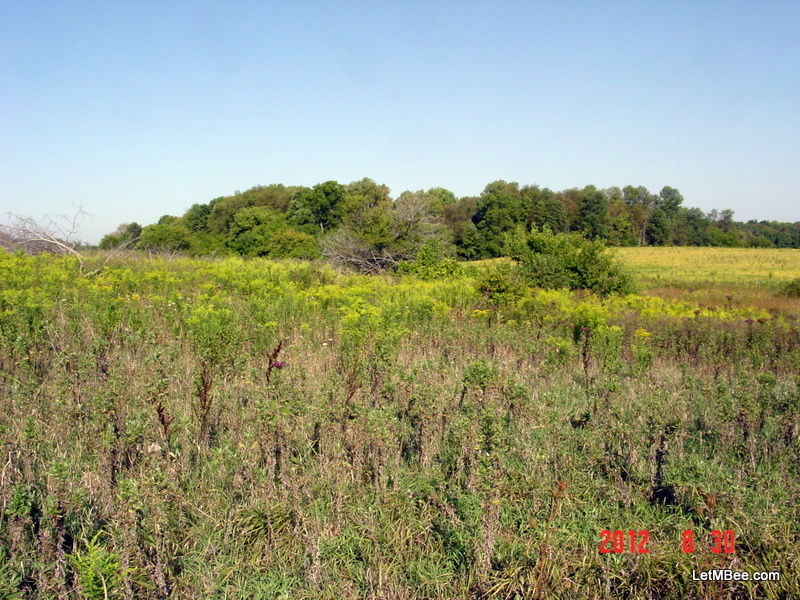 I may try for a limited goldenrod crop next year if I can get a hive well positioned for it. This year we had a heavy golden rod flow as well, It seemed short though. Also (unrelated) I have a problem with nearly noxious tasting honey, it has a strong unpleasant taste this year, not all of it is like this but enough is to flavor the whole batch. I’m not sure what plant the bees found this stuff from, we had almost zero clover because of the timing and drought. Was everything capped when you extracted? The first year I extracted twice and had some uncured nectar get in with one of my buckets. The stuff didn’t taste very good. Did you get any honey that was good? Another thing that happened is it rapidly crystallizing almost a week after extraction it went quite thick, the taste takes some getting used to, I wouldn’t want to try selling it though, I’m sure it was just because of our funky weather (early season + drought), it was very disappointing to not have that rich warm floral flavor though. Thats life in the non chem non factory world though sometimes them apples are gona have spots. I sent you an e-mail. Check it out and get back with me.